You are here: Home » Greska: What’s at stake for MU vs. Wisconsin? Greska: What’s at stake for MU vs. Wisconsin? If you told me I could lay a C-note on Marquette to beat Wisconsin, I’d check my wallet to make sure you didn’t just rob me. If you told me I could lay a C-note on Marquette to beat Wisconsin and I’d get the 10-point spread Vegas is giving, I would laugh and tell you I’d rather not throw money away. If you told me I could lay a C note on Marquette to beat Wisconsin and I’d get a 20-point spread I’d think very, very hard, but decline politely. Such is my confidence in the Golden Eagles on Saturday. It isn’t just that Wisconsin is that much better than Marquette (though it is), it’s that the Badger’s best attributes happen to fall in line with MU’s weaknesses. Marquette lacks height and girth, leaving it vulnerable on the offensive glass. In fact, it ranks 324th nationally in defensive rebounds. The Badgers fearsome trio on the frontline (Kaminsky, Dekker, Hayes) are all taller and stronger than Steve Taylor (or Juan Anderson) and will feast on any missed shots, much like Tennessee did in Orlando. But that’s not even scary to me. The biggest reason for my pessimism falls squarely beyond the arc. Marquette has been torched from the outside in its losses. Ohio State made 8 (53%), Omaha made 7 (41%) and Michigan State made 12 (52%). Remember the Spartans making it rain from long distance? It wasn’t just that they were ridiculously hot, they were also ridiculously open for a majority of the time. As much as the zone has helped MU control penetration, it still is giving up a lot of open looks. Looks that I see the Badgers feasting on. UW currently has seven players who have taken at least 15 treys and four of those are shooting at least 35% from long distance. Should one get hot? It’s over. Should two light up? It’s ugly. Should three or more have it going? Good thing I don’t live in Wisconsin anymore. I’ve laid out my thought process on what I expect from this game (pain, and lots of it). None of that, however, has anything to do with the title of the article and the reason you clicked on the link. I just wanted to establish the expectations of a writer looking through golden-tinted glasses. None. That is the beauty of this game. 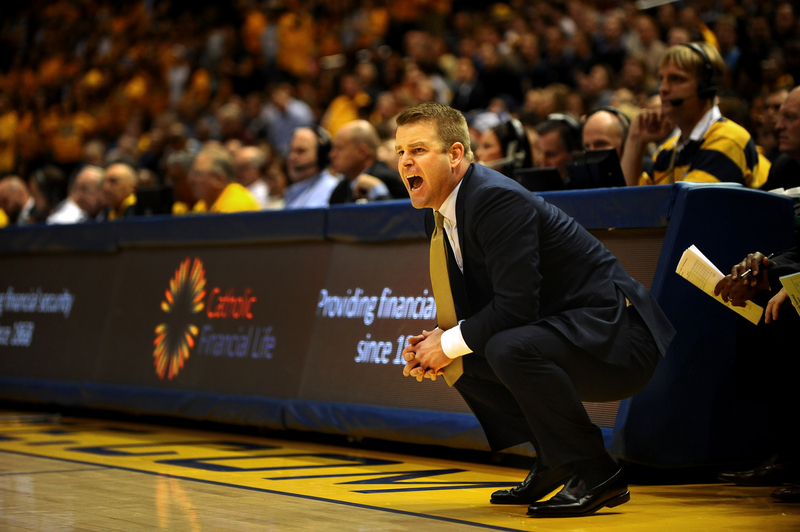 There is absolutely no pressure on Steve Wojciechowski or Marquette. It’s not like last year where MU was a league favorite, struggling to uphold lofty expectations. It’s not like in years past where two evenly matched teams do battle for reputation and publicity. It’s Wisconsin that is ranked second in the nation. It’s Wisconsin that had a relatively disappointing showing in a primetime game against Duke this week. It’s Wisconsin that needs to stomp the inferior intra-state rival. But, there’s always a but. Sam Dekker has been battling an ankle injury all season, and Jim Polzein of the Wisconsin State Journal reports he will be a game time decision. Dekker is a projected first-round draft pick this year. While the Badgers have some depth, losing your most athletic playmaker who would have feasted on smaller opponents is significant. Even having a hobbled Dekker limits some of that explosiveness that had scouts drooling at the LeBron James Camp this summer. A Dekker-less Wisconsin team is still a clear favorite, but the door slides ajar just a fraction. Maybe Duane Wilson comes out hot, determined to show who the top guard from Wisconsin is, draining a couple treys and getting to the line, like Blue did in 2012. Marquette’s defense gets its hands on some easy runouts keeping it close going into the intermission.The capacity crowd spurs on the scrappy underdog. Some floor gets slapped. Wisconsin gets frazzled. Wishful thinking, sure. But stranger things have happened. A win for Marquette against a top-5 opponent would be season-defining. It would alter the outlook completely of this year, from “let’s not embarrass ourselves” to “is a single-digit seed out of the question?” It would give MU probably the best win of the year of any potential bubble team. Take a moment to think about that. It wasn’t even two weeks ago that fans were asking me if Marquette might go winless in conference. It was a tad dour, sure, but not that ridiculous. I still have yet to fully buy in (neither has KenPom who has MU ranked outside the top-100), but seeing the way the team has responded is encouraging. The zone is much more suitable for this bunch than the press, and Wojo has altered his preferences to best match the skillset of this squad. There are two legitimate deep-threats in Matt Carlino and Duane, while Derrick has been much more aggressive, to decent results. One final time, I do not believe anything other than a Wisconsin rout is in store. But that’s the beauty of this game. My words mean zilch. With all the emotions involved, rivalries are a bit more susceptible to outliers than a normal tilt might be. Marquette has absolutely nothing to lose in the midst of a rebuilding season and just about everything to gain.